**This post is very long, as it is a step-by-step recipe! I have many hobbies, but one of my favorites is my obsession with wonderfully prepared and delicious food. I am a foodie……which is probably why I’m fat :-). Julia Child is at the very top of my list when I think of Gourmet Food. When the movie, Julie and Julia came out, I just had to have her cookbook and try to cook as many recipes from it as I could. I did, and I am a much better cook because of it. 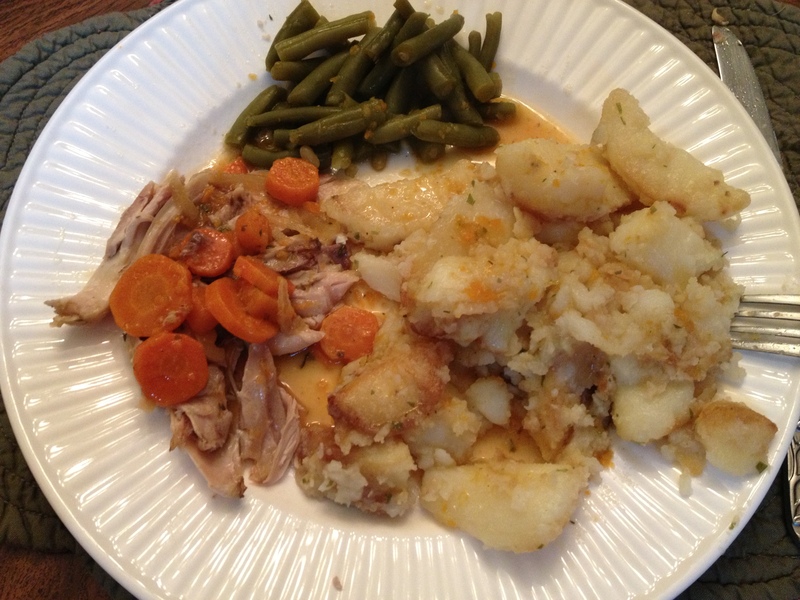 One of my family’s favorite dishes is Casserole-Roasted Chicken with Tarragon. It can be complicated, as all of Julia’s recipes can be, if you want to serve it for a formal dinner. However, I have cooked these recipes so often, that I can whip them up for my family in a jiffy……just not as pretty 🙂 I will first give the easy recipe for this delightful and satisfying meal, and afterward, I will show you a picture of the “Fussy Formal French Dinner” version…….which has it’s place in your repertoire as a sure crowd pleaser for when you are having special company. The Easy recipe, however, is for when you want real good food, fast. This recipe is enough to feed a family of 6 to 8, depending on how much chicken your big boys can eat. My husband and oldest son each receive one and a half breasts. My oldest daughter eats a breast, and then the little ones and I eat the dark meat (with plenty of meat left over for sandwiches or snacks). It is VERY economical for gourmet food, @ $2.60 per person (based on 8 people). The original recipe calls for ‘trussing’ the chicken. 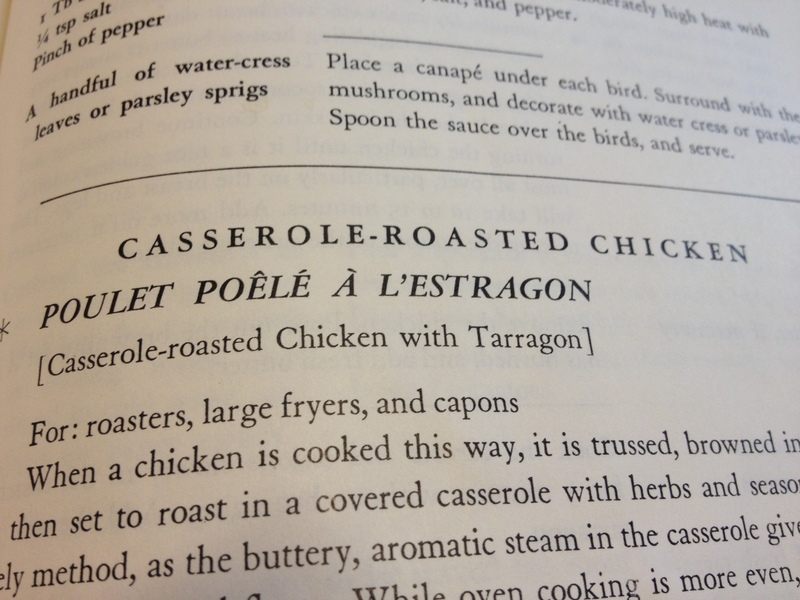 We are not going to do that in this recipe, which cuts out time. Nor are we going with any ‘optional stuffings’ or alternative seasonings, which Mrs. Child offered for variation. 2. Season inside each bird with 1 tablespoon of butter and the salt, pepper and Tarragon. 3. 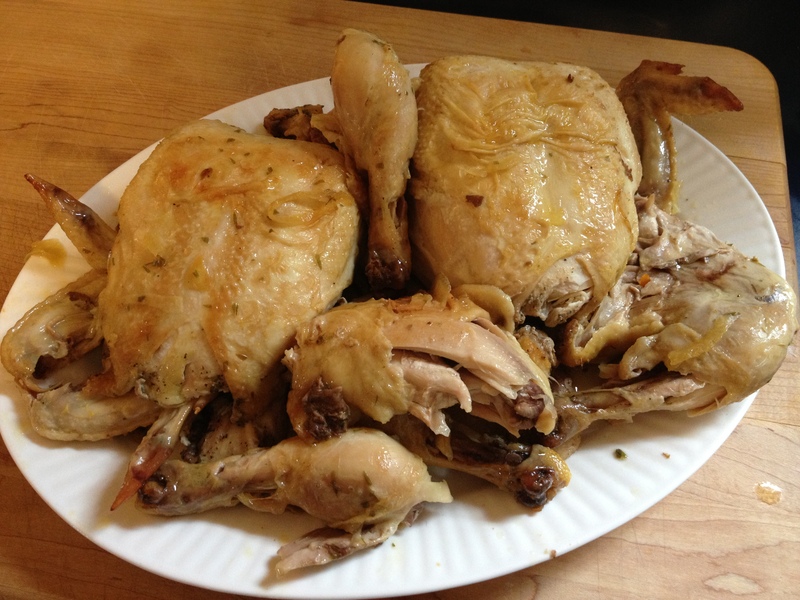 Dry the skin of the chickens with paper towels, and then rub the skin of each chicken with 1 tablespoon of butter. (2) heavy Casserole Pans, with lids. 1. Set heat on stove burners to medium high heat, place butter and canola oil into each Casserole pan. 2. When butter foam begins to subside (the butter will be very foamy at first), place chickens, breast side down, into pans. 3. Let the chickens brown for 2 to 3 minutes, careful not to let the butter burn. 4. Turn the chickens onto their sides (using 2 wooden spoons, careful not to break the skin), and let them brown for 2 to 3 minutes. 5. Turn the chickens onto the other side, and then back side, until both chickens are evenly browned all over. 6. Remove chickens to a large serving platter, or two plates. 1. 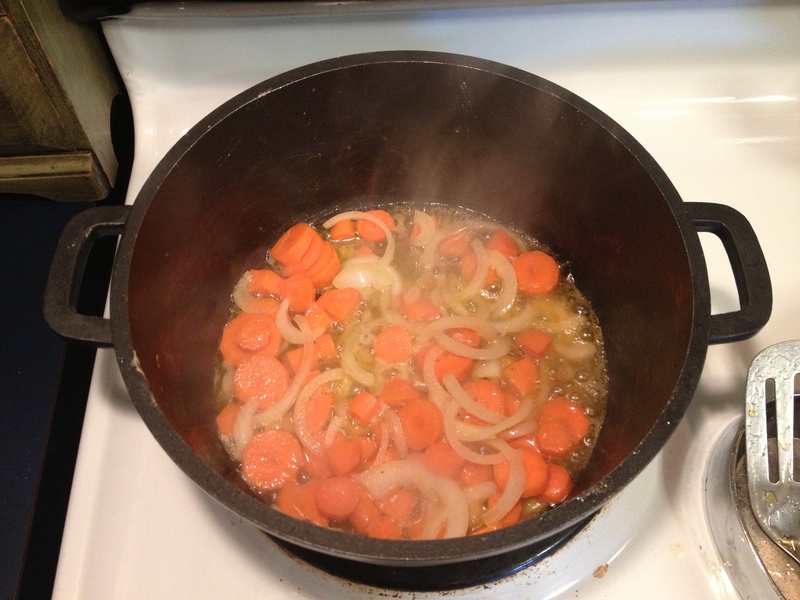 Cook the carrots and onions slowly, still on medium high heat, in the pan for about 5 minutes….careful not to brown or burn. 1. 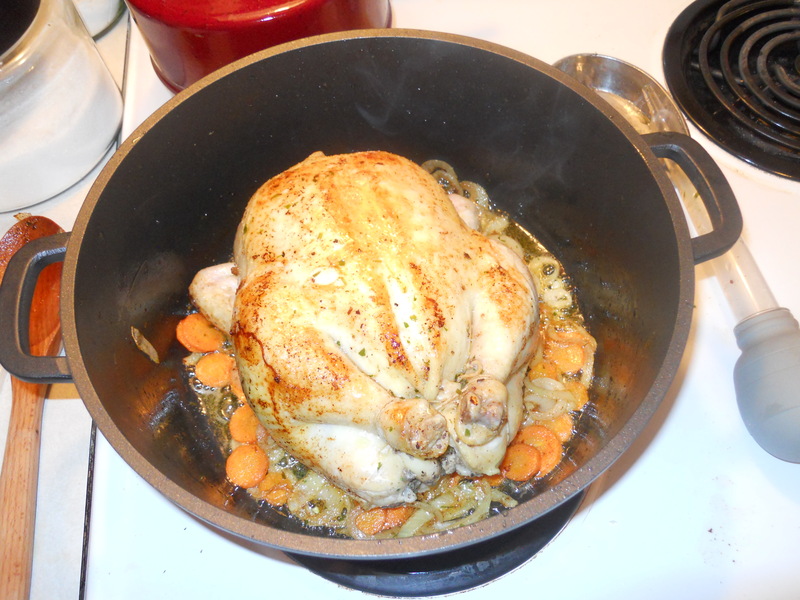 Place chickens on top of carrot/onion mixture, in each pan. 2. Sprinkle top of chickens with salt. Cut (1) square of aluminum foil for each pan. 1. 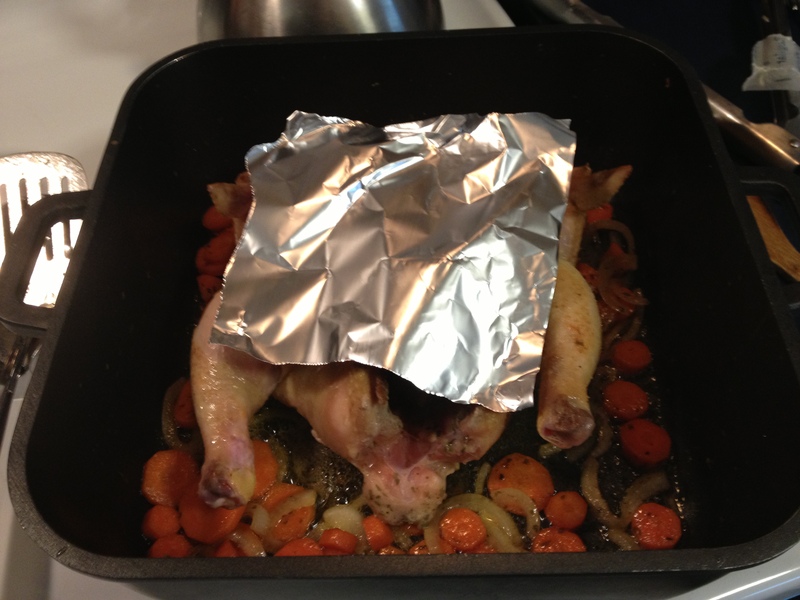 Place the square of aluminum foil on top of each chicken. 2. Secure lid onto Casserole pan. 3. Make sure butter is sizzling in pan, and then put both pans into the oven, on the middle rack. 4. Bake for 1 hour and 20 minutes, or until done (chicken legs will move around easily in their sockets, or the skin will fall from the bone there), basting the chickens every 20 to 30 minutes, with it’s juices, using a large spoon, or turkey baster. Green beans are the one vegetable that my entire family enjoys. 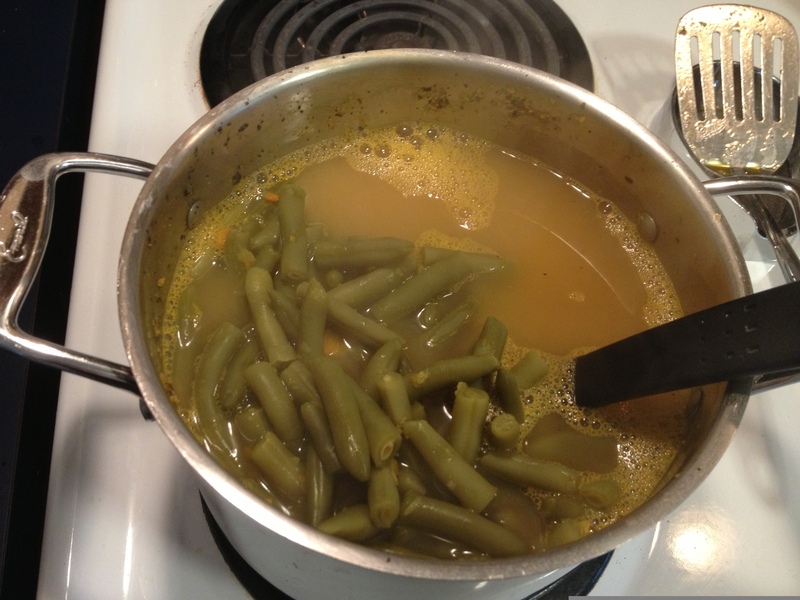 To keep the beans healthy, I use my own Vegetable Bouillon, which you can find the recipe for here: https://raisingservantsofchrist.com/2013/05/14/frugal-and-healthy-cooking-alternatives-vegan-style/ If you do not wish to make your own (please reconsider…..it is sooooo good! 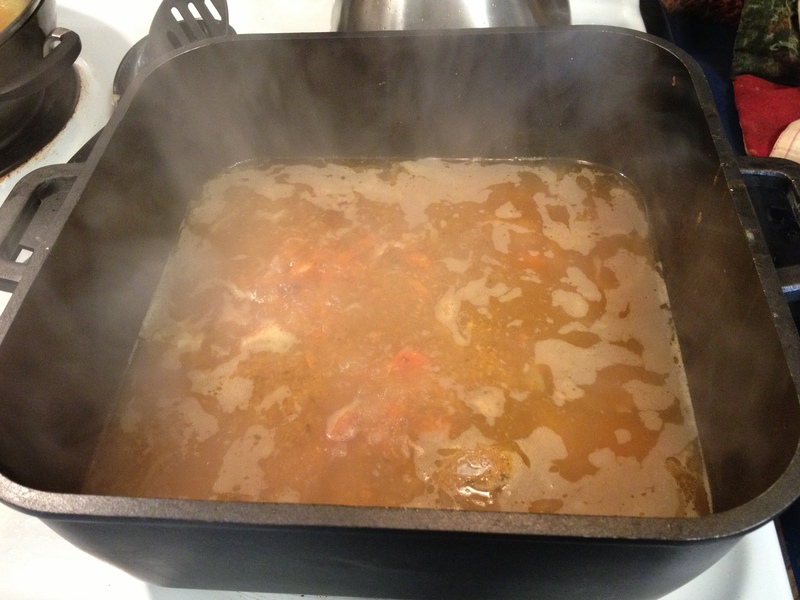 ), you can use chicken or beef bouillon instead. 1. 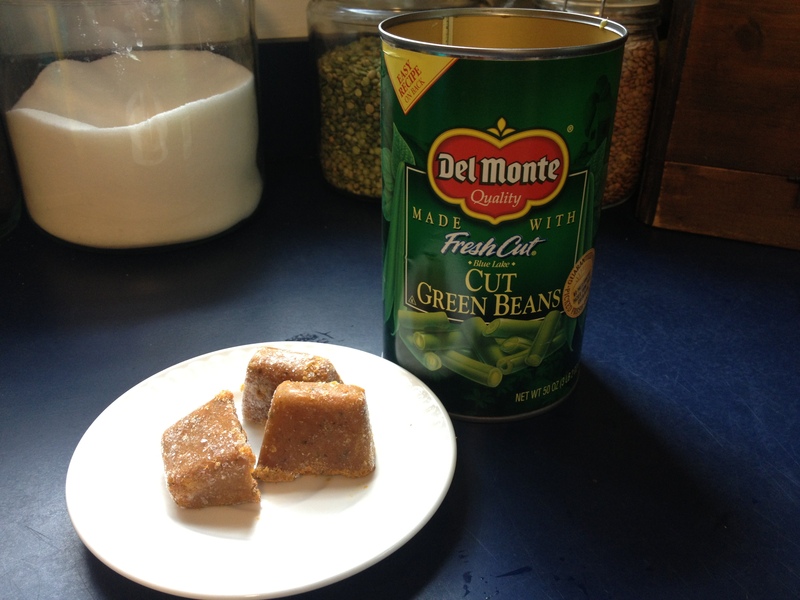 Drain green beans and add to small stock pot. 2. Cover with enough water to fill 3/4 of the pot. 3. Add pepper and bouillon. 4. Bring to boil over medium high heat. 5. Turn down to simmer, until ready to eat (add more water if necessary). It also asks for clarified butter. 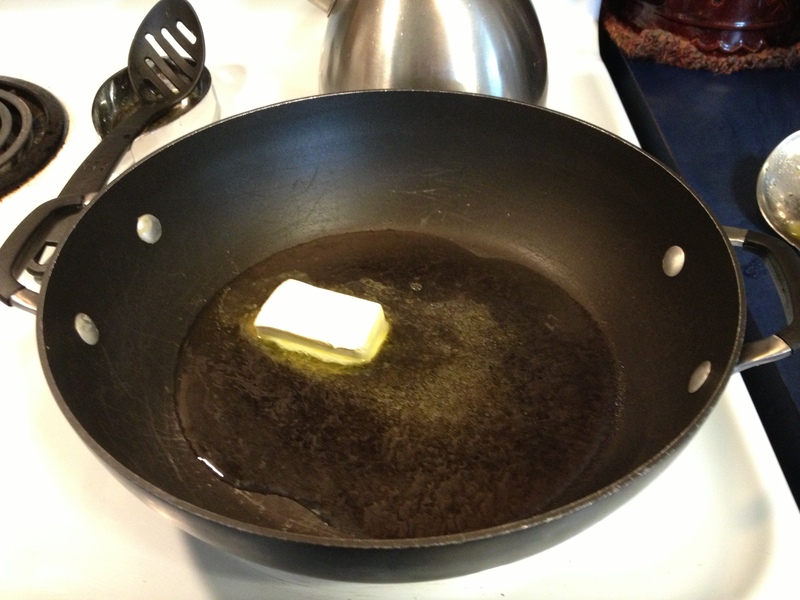 Let me just say, that after learning how to clarify butter, I called my Mama up (who is an AMAZING cook), and she told me that it would never be necessary for me to go through all of that again…….instead we use a butter/oil ratio to get the desired results. 1. 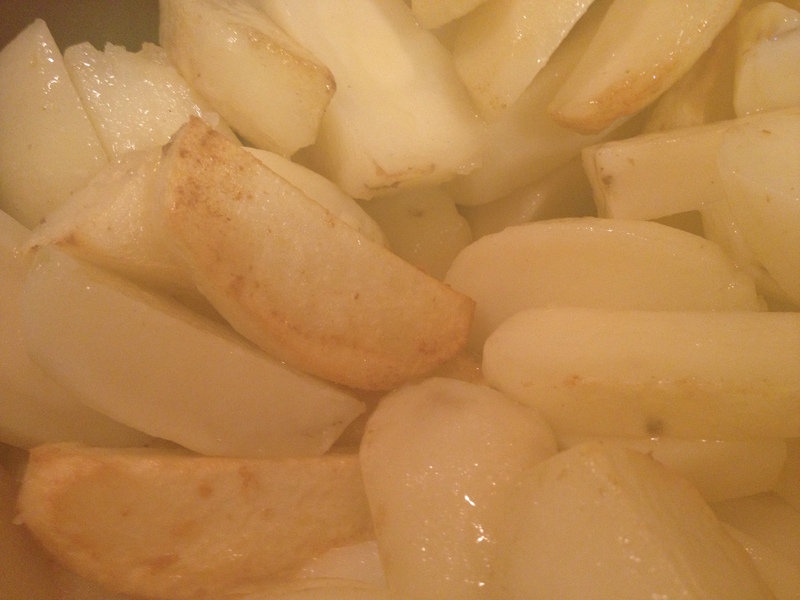 Peel potatoes….DO NOT WASH.
2. 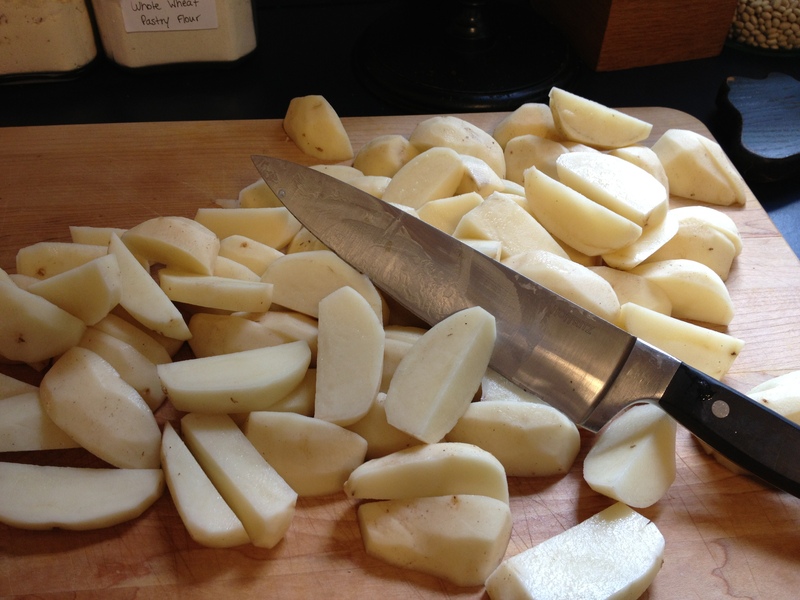 Cut potatoes into quarters, long ways. 3. 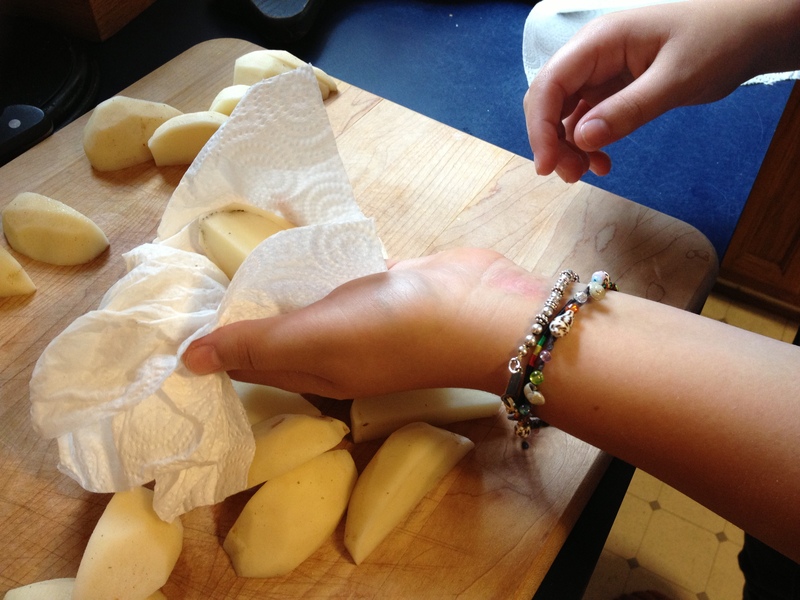 Press and squeeze each potato quarter into paper towels, getting most of the surface water out. Get your older daughters into the kitchen with you. 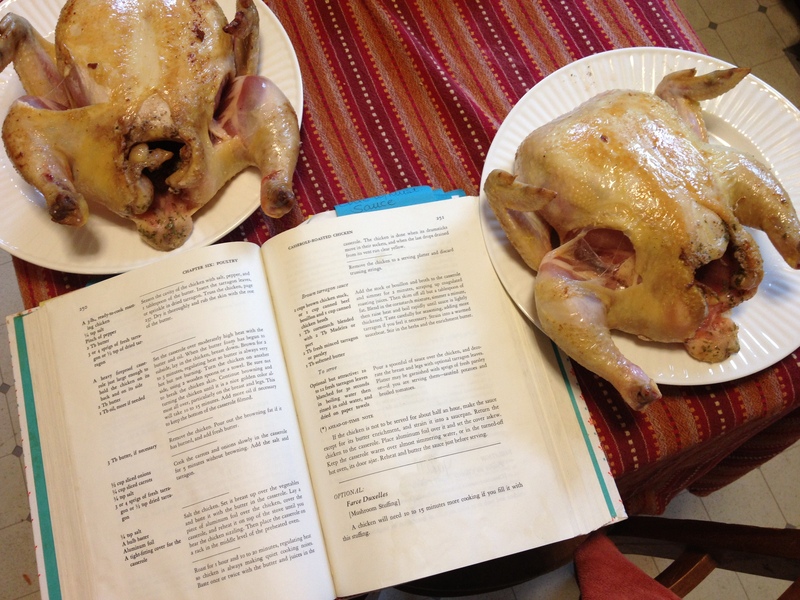 They make great assistants, and my 15 year old daughter can cook Julia-style right along with me now. 1. Put butter and oil into pan. 2. Turn the burner on to medium high heat. 1. Once butter foam has subsided, add potatoes to the pan, stirring constantly at first to coat all of the potatoes in the butter mixture. 2. 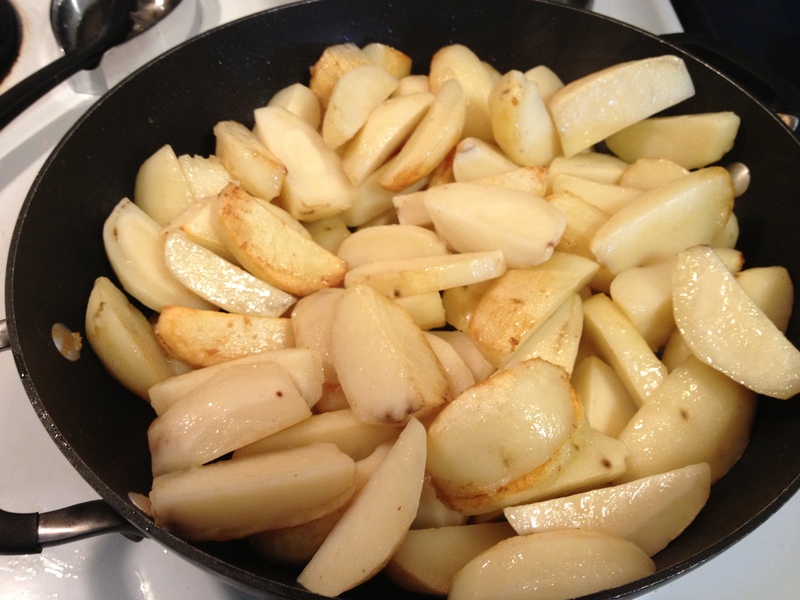 Cover pan with lid, and let the potatoes ‘sear’ for 1 to 2 minutes, then stir. Repeat until all the edges of the potatoes are browned along the edges. 3. 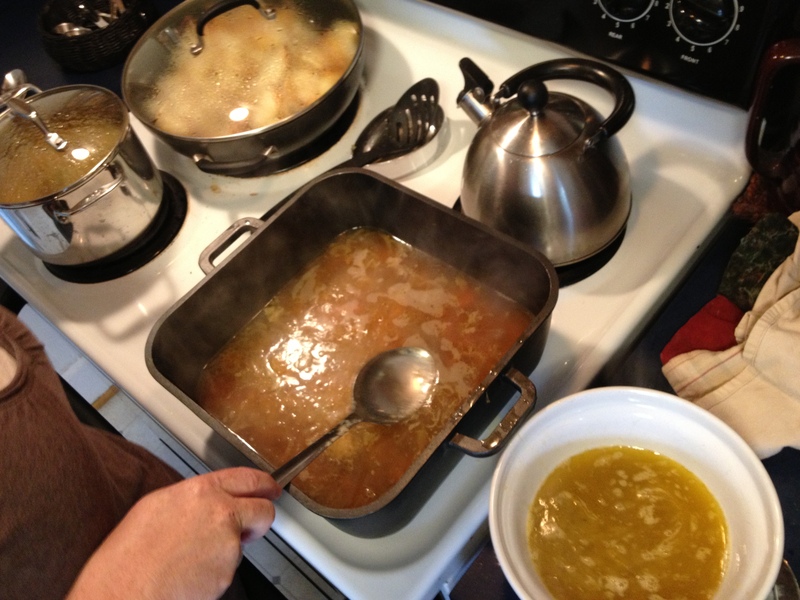 Keep stirring and returning lid for about 30 to 40 minutes…..or until potatoes are crispy on the outside, and done in the middle. 1. Turn the potatoes down to simmer. 2. Add salt, butter and tarragon, stirring until well distributed. NOW IT’S GO TIME……time to pull it all together!! With all gourmet or ‘fancy food’, time is of the essence when your about 10 minutes away from serving. Make sure that the table is set, the drinks are made, and your kids are ready to help. 1. Turn oven off, and take out casserole pans. 2. Carefully take out chickens, and arrange on a serving platter. 3. Pour chicken liquids into (1) casserole pan. 4. Add veggie or chicken broth. 5. Set casserole pan on stove burner at medium high heat. 1. Place a medium size bowl beside the casserole pan (on the counter beside the stove). 2. Using a large spoon, ‘skim’ the fat off the top of the chicken juices. Make sure to get almost every bit of fat off that you can. **If you have never skimmed the fat off of juices before, you just shallowly dip the spoon, just “skimming” the surface, until you get all clear oil and no murky pan juice. 1. Turn heat up to high. 2. 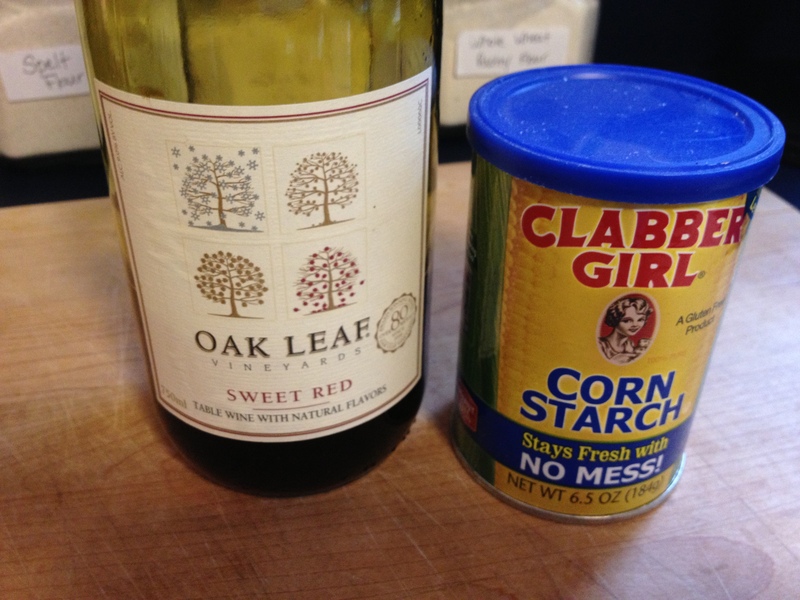 Mix corn starch and wine in a small bowl, until disolved. 3. Once chicken juices are boiling rapidly, whisk in the corn starch mixture. 4. 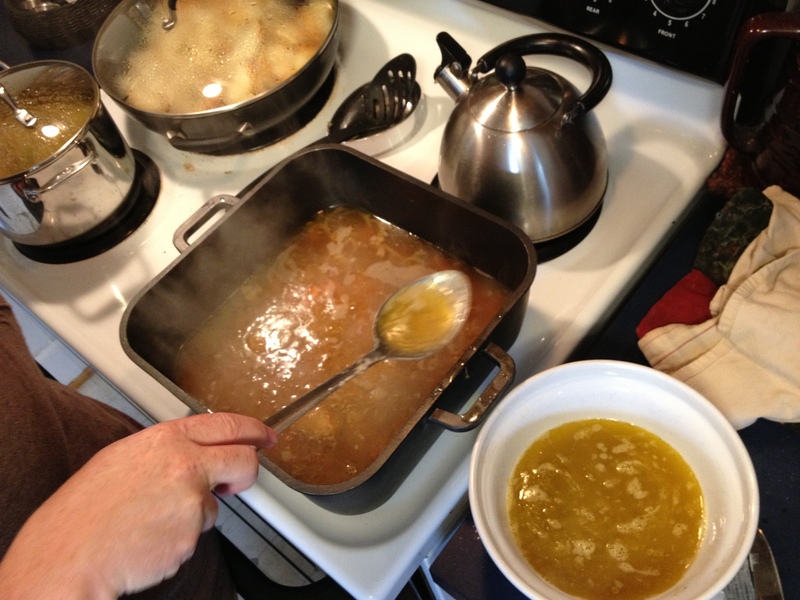 Boil rapidly until sauce is slightly thickened. 5. Taste carefully for seasoning, adding salt as needed. 7. 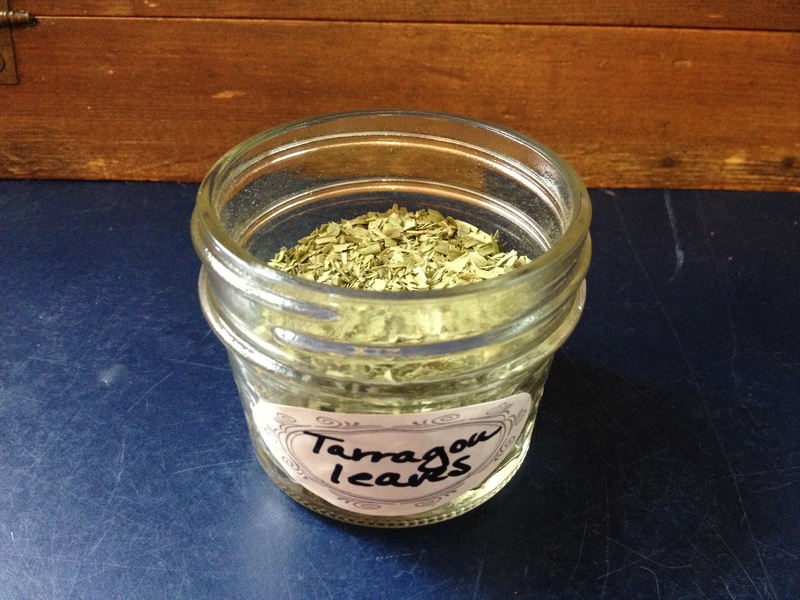 Add butter (called enrichment butter) and tarragon, stir well. 8. 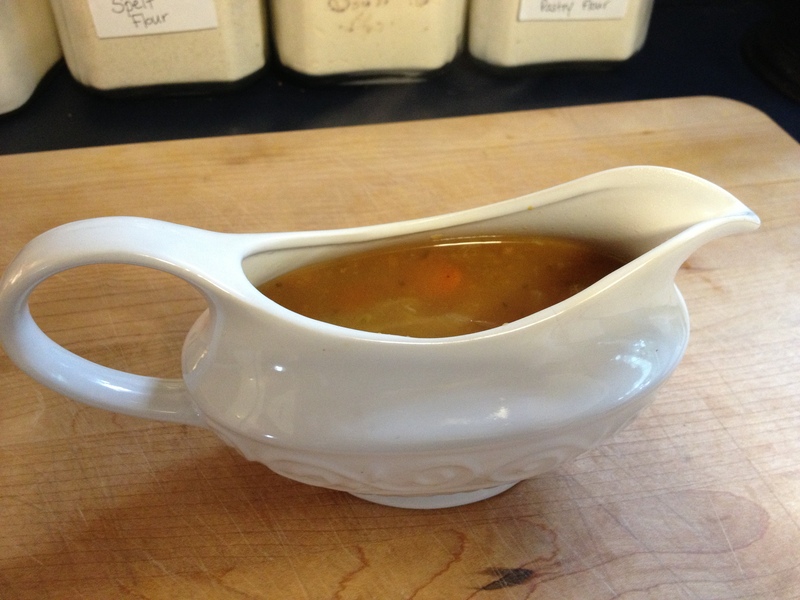 Pout into gravy boat. 1. Put potatoes and green beans into serving bowls. 2. Place all items onto table…….and enjoy!!!!!! We put the sauce onto the chicken and the potatoes. Trussing the chicken simply means ‘sewing it up’. Using a large mattress needle, you sew the wings to the sides and the legs together…..which helps keep stuffing inside the bird, if that’s the variation you are cooking. 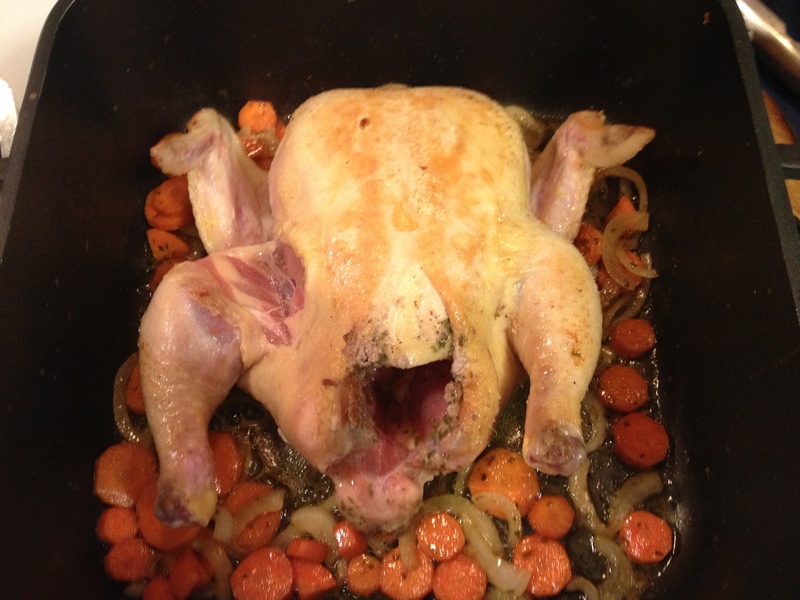 Notice, the bird has been trussed, and ‘dressed’ with the sauce. 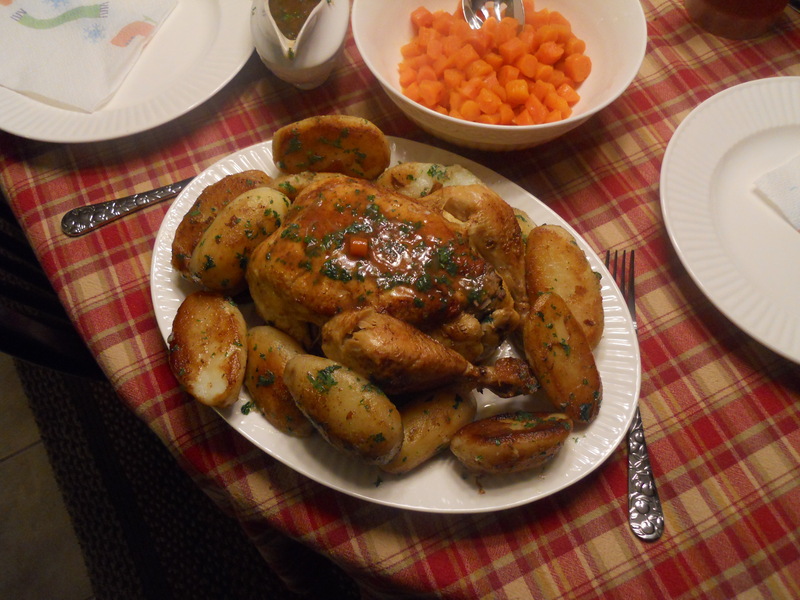 The potatoes are served along side of the chicken, and they have been carved before cooking into that elongated look I spoke of earlier, so the potatoes ‘roll’ in the pan. All have been sprinkled with parsley. ← Easy Asian Chicken and Rice……Sure to Please and Fill Up Everyone in the Family!